This week we have finally managed to complete our squash harvest. 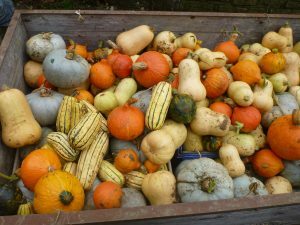 They make a wonderful, colourful display sitting in the poly tunnel where they are curing before being collected for sale at the farm gate, in our boxes and at the farmer’s market. We have a good selection of sizes of Uchuri Kuri (red onion squash), Delicata, Butternut and the King of All Squash, Crown Prince. All are delicious either roasted or in soup. We have been busy planting both calabrese and cabbage seeds which hopefully will germinate in the poly tunnel and then be planted out at the beginning of February. We have also been planting carrots outside and covered them with our own home-made cloche tunnel which, hopefully, will enable them to withstand the worst of the winter weather and enable us to have new carrots early next season. Soon we will be able to sew more carrots in the poly tunnel having removed the french beans which eventually stopped growing last week. Summer is really over now!